Book Condition: Ex-library book with usual markings. Good Condition. Five star seller - Buy with confidence! Comment: Ex-library book with usual markings. Good Condition. Five star seller - Buy with confidence! Ships from and sold by scholar-basement. You'll find Business in Mexico the ideal handbook for effective cross-cultural business dealings. 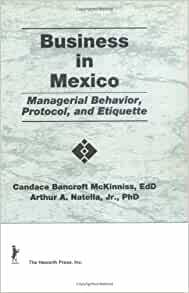 You'll gain information on culture and behavior as they relate to U.S.-Mexican business protocol and relationships, background on the country and culture of Mexico, and guidelines for social and business interactions. You'll learn of the historical differences between North American and Latin cultures and the resulting effects on interpersonal and business relations. Since it is impossible to predict all social situations, the authors provide information to enable you to use common sense in situations not specifically addressed in the book. The book includes a helpful glossary of Spanish business terms and general vocabulary words, along with a list of Mexican holidays for scheduling reference. Trade with Mexico is an important venue of business, and businesspeople, students and professors of business, marketing executives, and human resource managers will not want to be without this book. Business in Mexico is a first step in successful U.S.-Mexico trade. Drawing from their academic, business, and consulting experience, the authors offer a timely book about doing business in Mexico. While Mexican and U.S. businesses have historically distrusted each other, they face an age of transition in light of NAFTA and current economic necessities. The work opens with a discussion of topics about culture, family, heritage, and political-economic history and closes with both general and specific "how to" business issues such as telephone etiquette and social interaction. The work features an appendix on holidays and an extensive glossary of basic business and general vocabulary. Although written primarily for business leaders seeking commercial arrangements in Mexico, this practical book will be helpful to academics and government officials of English-speaking nations.